A crime wave! 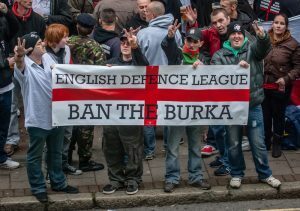 Sharia law! No-go zones! Terrorist cells! Rapists everywhere! Muslims outnumbering white people! If you believe President Trump’s tweets, you’d think the entire European continent is crumbling in the face of hordes of invading Muslims taking advantage of “open borders” to subvert nations’ cultures and institutions and then destroy them in the name of Islamic fundamentalism. However, these anti-Muslim stories are part of a carefully calculated disinformation campaign designed to whip up Western islamophobia. It begins with tabloids or racist local media in European nations, aided by other sites that translate and help to disseminate stories among English speakers on the internet. Eventually those stories make their way to right-wing sources such as Breitbart and Fox News, and thus to President Trump, who tweets them to his followers. It can be difficult to spot a news site that isn’t legitimate if you don’t look carefully. 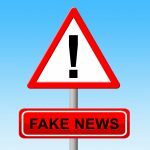 Many fake news sites are deliberately designed to appear legitimate, sometimes to the point of even having a domain name close to that of a real news site. For example, ABCnews.com.co is a pretty well-known fake news site, although it’s easy to mistake it for the real ABCnews.go.com because it even makes an effort to look like the real ABC site. A particularly difficult type of fake news site to detect is one that has a legitimate-sounding name like NationalReport.net or TheLastLineOfDefense.org (both of these are fake news sites, by the way). You can find lots of other tips on spotting fake news sites in this Lifewire post. So, how does this anti-Muslim “Disinformation Superhighway” work? Once a story with anti-Muslim bias is posted in the European tabloids and racist sites mentioned above, it gets shared by what Buzzfeed News calls “key nodes.” These include Breitbart London, Russian government-backed RT, the Gatestone Institute (a right-wing think tank that calls itself an “international policy council”), and Voice of Europe (which helpfully disseminates anti-Muslim news in 18 languages). Other smaller media outlets include The European Post and Gates of Vienna. Once the stories are shared and translated, they quickly travel through the conservative media ecosystem. To give one example, BuzzFeed analyzed the top 50 stories about continental Europe shared by Breitbart in the first five months of 2018. Of those, 33 were primarily about Muslims and immigrants, and most of them cast those individuals in a negative light. Two-thirds of those stories originated from non-English local news outlets in places like Italy, Germany, and Sweden. Those Breitbart posts were cited or shared by other conservative news outlets and prominent anti-Muslim individuals… up to and including President Trump. But there’s an eastbound lane in the Disinformation Superhighway, too. What do we do about this? We already know that partisan echo chambers amplify sentiments because the people inside those echo chambers spread anti-Muslim stories. Before too long, those stories are picked up by major conservative news outlets, which then increases their ability to appear on the “front page” of web search results. The best way to promote the truth is not to react to those stories and give them more attention. Instead, we need to spread our own truthful stories about Muslims in Europe and the U.S. and hope that our own networks will amplify those narratives, too.